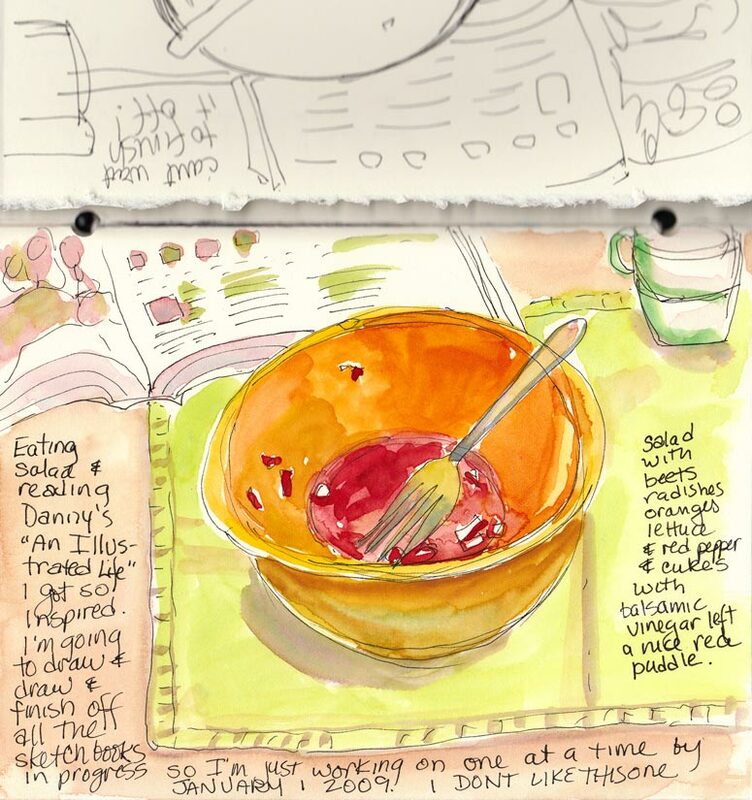 I was feasting my eyes on Danny Gregory‘s new book, “An Illustrated Life” while I was eating a delicious salad in my big yellow salad bowl for lunch today. When I finished eating I had to sketch the colorful remains. The first drawing didn’t work (partially seen on the previous sketchbook page above), though I took it as far as I could and then drew it again and painted it (happily using up two pages in this sketchbook I don’t like). I love reading about all the other sketchbook artists in Danny’s book and the way they think about sketching and their sketchbooks. It inspired me to finally finish off all of the random sketchbooks I have going. I have at least half a dozen unfinished sketchbooks, some that I’ve made (like the one used above) and some that I’ve bought. I keep them in a special open box and grab the one that calls to me. There are several that I don’t like for a variety of reasons (e.g. don’t like the paper, don’t like the dimensions, don’t lay flat, don’t scan well, too fancy…) and they’ve been partially used and abandoned. I’m making it my goal to fill them all by January 1 so that I can put them on a shelf and start working in one book at a time in a chronological order. I like order. Next Post: What Makes Sweaters Itchy? Yes, isn’t it wonderful to look at other people’s sketchbooks? I just love it. And boy, I’m with you on the unfinished sketchbooks. I do one drawing that I dislike in a sketchbook and then it’s covers closed. That’s a good goal, and I really like this colorful sketch too. “…I like order…” you said. OK, here’s the deal – you come to my place and organise me! Well, my sketchbooks at least;I draw all over the shop! You and I are thinking along the same lines. I’ve been reading a few entries from An Illustrated Life each night, and like you, I have been moved to finish up some sketchbooks. In particular there are four sweet little suede covered books given to me when I retired by a dear friend. I think they were meant for journaling, as in writing, because the paper is awful for anything wet. But I don’t care. The plan is to give into my obsessive compulsive tendency and just fill them in so I can move on. I’m so glad to know that I’m not the only one with several half completed sketchbooks laying around. 🙂 I just grab which ever book is handy to sketch, so none of them are designated to just one technique or theme. It’s hard to find a previous sketch sometimes, but it’s fun seeing all the ones I’d forgotten about again. 🙂 Good idea about completeing them by Jan, but I couldn’t do it. Too much going on right now, plus I have just started in some. 🙂 Good luck with completing yours though! Wow – zingy yellow or what! I start a new sketchbook for each painting holiday I go one – but rarely finish them so I’ve got a number which get finished off with drawings of the cats at home!